Broadcom Foundation supports academic workshops around the world that foster innovation and insight and inspire leadership and collegiality among university students who are performing research in related and interdisciplinary fields of engineering, science, medicine and other STEM fields. The Broadcom Foundation’s President and Vice President of Academic Research & University Relations coordinate workshops led by faculty at select universities in Asia, the EU, UK, India and the United States. 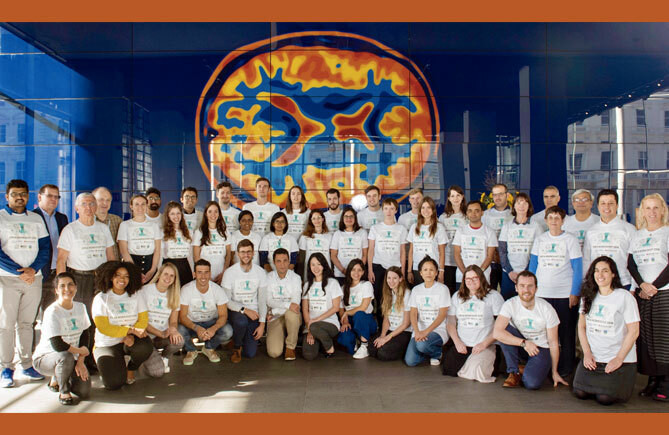 In its second year, the EMEA University Student Research Workshop on Brain Emulation was hosted at Imperial College in London from October 5-10, 2018 and featured seven PhD students from Imperial College (London), Tel Aviv University (Israel), University College Dublin (Ireland) and Indian Institute of Science, Bangalore (India). Organized and chaired by Dr. Pantelis Georgiou, Reader in Biomedical Microelectronics, Department of Electrical and Electronic Engineering, Centre for Bio-Inspired Technology, Imperial College, and graduate student chair Ms. Amparo Guemes, the workshop entailed multi-disciplinary teams working to innovate solutions for challenging brain-related disorders such as Huntington’s disease and traumatic brain injury. Teams also worked on finding ways to evolve computing beyond Moore’s law using inspiration from the brain. Each project was presented and scored by a distinguished jury of experts. The workshop also featured a range of scientific talks from leading neuro-technology and brain-inspired computing experts from Imperial College as well as inspirational industry experts including Eben Upton, founder of the Raspberry Pi Foundation, Ms. Nicole Washington of OCTANe, Orange County, California, Mr. Gordon Lindsay from Cypress Semiconductor and Dr. Gregory Washington, Dean of The Henry Samueli School of Engineering at the University of California, Irvine. Social events and activities including a treasure hunt in the Science Museum, a visit to the London Eye and a cultural day at Windsor Castle further built long-term collaborations between the students and enhanced their professional and personal growth. Climate Change, Energy Scarcity, Cyber Security, Healthcare and Sustainability all require innovation in SMART Manufacturing through collaborative research and development between industry and academia. The Asia Pacific University Student Research Workshop is designed to rapidly fill knowledge gaps in helping to advance efficient manufacturing solutions and inspire younger generations to join the manufacturing forces in order to meet the world’s grand challenges and help develop solutions. Held in Pasadena, California in the spring of 2018, the Asia Pacific University Student Research Workshop is an international, interdisciplinary partnership between the University of California, Irvine, CA, the National Chiao Tung University, Taiwan, and the University of Hong Kong, China. Twenty-two graduate students with diverse backgrounds and skills engaged in intense, team-driven innovation to tackle how we might expand the means and methods to develop the necessary knowledge to develop efficient manufacturing technologies and therefore contribute in the harnessing of energy from finite resources to power the global society in an exponentially technology-driven world. The Broadcom Foundation is the proud sponsor of the KKT Workshop, a long-standing international collaboration between Keio University in Japan, KAIST University in South Korea and Tsinghua University in China. The universities rotate hosting 30 engineering students — 10 from each university — who design their own research symposium program that is held at the host university. The workshop was hosted at Keio University in 2016, Beijing, China by Tsinghua University on April 24-25, 2017 and Seoul, South Korea by KAIST on July 29-31, 2018. The KKT Workshop creates a unique opportunity for students to forge life-long friendships across cultural lines for future collaborations in their diverse fields of interest. From 2010-2015, the Foundation sponsored the Broadcom Foundation University Research Competition that rewarded innovation in university research by graduate students from top engineering programs around the world. Building upon the remarkable success of KKT Workshops, Broadcom Foundation sponsored a student workshop and symposium with Broadcom Foundation Fellows from the University of California, Irvine’s California Institute on Telecommunications and Information Technology (Calit2) and UCLA Henry Samueli School of Applied Science and Engineering. The UCI/UCLA Student Research Workshop and Symposium took place at the UCI Henry Samueli School of Engineering. UCI fellows doing research on sensors, actuators, controllers, electromagnetic components and 3D packaging technology had the opportunity to interact with UCLA fellows focused upon CMOS integrated circuit design, embedded systems design and related areas. Broadcom co-founder and CTO Henry Samueli interacted in a Q&A session with workshop participants who have been under the guidance of Professor G.P. Li at UCI and Professor Ken Yang at UCLA.